The Altman UV-250 is a compact, high output blacklight floodlight. 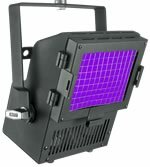 It is designed to provide a wash of high intensity illumination of fluorescent materials at distances of up to 40 feet. The luminaire does not require any fans for cooling, resulting in extremely quiet operation. A special lens filters out harmful UV-B and UV-C wavelengths and almost all visible light, and is provided with an integral wire mesh safety screen.